Peña-López, I., Congosto, M. & Aragón, P. (2013). “Spanish Indignados and the evolution of 15M: towards networked para-institutions”. In Balcells, J., Cerrillo i Martínez, A., Peguera, M., Peña-López, I., Pifarré de Moner, M.J. & Vilasau, M. (Coords. ), Big Data: Challenges and Opportunities, 359-386. Proceedings of the 9th International Conference on Internet, Law & Politics. Universitat Oberta de Catalunya, Barcelona, 25-26 June, 2013. Barcelona: UOC-Huygens Editorial. This one paper has been published at the Journal of Spanish Cultural Studies as Spanish Indignados and the evolution of the 15M movement on Twitter: towards networked para-institutions . The paper explains how is it possible that a movement can actually work with a distributed (and ever changing) leadership, and how it ends up looking like an institution on the outside, but as a network on the inside — which we call a para-institution. The Arab Spring, the Spanish Indignados, the Occupy Wall Street movement, the #YoSoy132 movement, the protests in Istanbul’s Taksim Gezi Park, the Brazilian Spring (#jan25, #arabspring, #15M, #ows, #YoSoy132, #occupyGezi, #vemprarua): in the last three years the world has witnessed the emergence of networked citizen politics. These movements are not institutions, but oftentimes mimic their nature. At the same time, they are unlike traditional citizens’ movements, but very much alike in their decentralized structure. Networked citizen politics, characterized by decentralization, swarm-like action and an intensive use of information and communication technologies have been playing an increasing role in worldwide protests and movements, often overtaking and circumventing the actions of governments, parliaments, political parties, labour unions, non-governmental organizations, mass media and all kinds of formal democratic institutions. 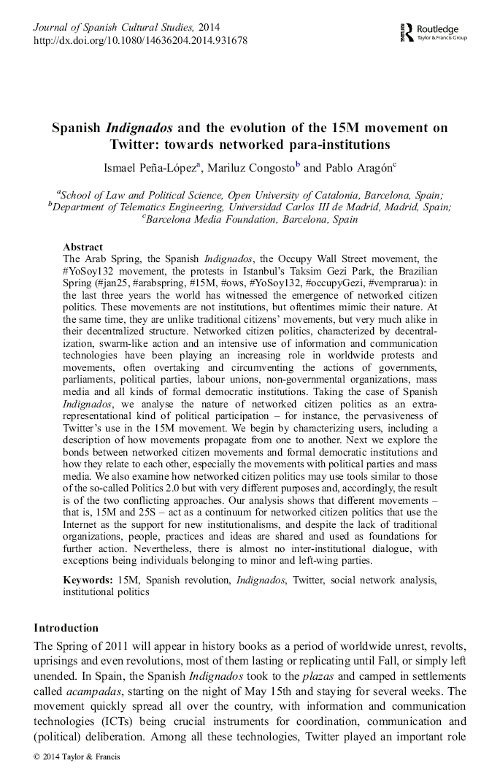 Taking the case of Spanish Indignados, we analyse the nature of networked citizen politics as an extra-representational kind of political participation – for instance, the pervasiveness of Twitter’s use in the 15M movement. We begin by characterizing users, including a description of how movements propagate from one to another. Next we explore the bonds between networked citizen movements and formal democratic institutions and how they relate to each other, especially the movements with political parties and mass media. We also examine how networked citizen politics may use tools similar to those of the so-called Politics 2.0 but with very different purposes and, accordingly, the result is of the two conflicting approaches. Our analysis shows that different movements – that is, 15M and 25S – act as a continuum for networked citizen politics that use the Internet as the support for new institutionalisms, and despite the lack of traditional organizations, people, practices and ideas are shared and used as foundations for further action. Nevertheless, there is almost no inter-institutional dialogue, with exceptions being individuals belonging to minor and left-wing parties. Peña-López, I., Congosto, M. & Aragón, P. (2014). “Spanish Indignados and the evolution of the 15M movement on Twitter: towards networked para-institutions”. In Journal of Spanish Cultural Studies. New York: Routledge.